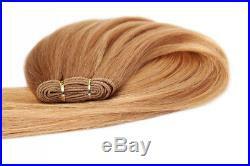 Length 24 long (62cm) This is a hair weft – not a clip in set. Double weft (2 wefts sewn together). Machine sewn weft along the top. Approx 2.5ft – 3ft wide. 65 Grams is classed as a salons average half head. This amount is perfect if you already have long hair but just want to thicken, lengthen and add volume or colour to your already long hair. If you are looking for a Full Head we would suggest 110 Grams or 180 Grams depending on your hair length/thickness and desired result. Remember when the hair weft is unravelled, fitted and washed it does fluff up and will appear fuller than when 1st taken out of the packet. Approx 5ft – 6ft wide. 110 Grams is classed as a salons average full head and generally this is enough for most customers. However depending on your hair thickness and length, salons will sell you additional half packs to make up to your desired thickness. The amount you require always depends on your desired result. If you have above shoulder length hair, are all over corn row braiding or have very thick hair you will require an additional half head 65 grams or alternatively go for the 180 gram deluxe extra full weft to get a natural fuller look. Deluxe Extra Full Head. Approx 8ft – 9ft wide. 180 Grams is the perfect choice in hair weight if you have shorter than shoulder length hair, are all over cornrow braiding, have very thick hair or just want a really full glamorous look. Colour advise and Mixing colours Unlike other sellers our photos are not stock photos taken from the internet. All our photos are of our actual hair individually photographed in natural daylight without a flash. We try our very best to show the real colour of our extensions but please always bear in mind hair is multi tonal and will always appear different in different lighting and on different computer monitors. Always send us at least 2 pics of your hair taken outside in natural daylight. Pre bonded nail tips (also known as U tips) are a popular choice for those looking for a more permanent extension as they can be worn up to 3 months before requiring maintenance. The bonds are made of quality italian keratin glue, which is both gentle on your hair but will also provide a good hard bond that will last. Nail tips are applied with a heat connector wand and 100% acetone and removal pliers are required for removal. We advise professional application and removal only. Nail tip hair is great for adding quick highlights through your own natural colour without the damaging effects of bleaching. Or you may opt for a full head of these hair extensions for celebrity style glamourous length and volume. Colour: 1 Jet Black. Hair Type: 100% Human Indian Remy Grade AAA. Length of Hair: 20 (52cm). Style: Silky Straight but has a slight natural wave if left to dry naturally. Weight of Hair: 1 gram per bond. 1 gram bonds are a great choice if you do not want too many bonds in your hair. They are suitable for all hair types and the added bonus is that compared to 0.5g bonds it only takes half the application time and half the removal time. Once you try our 1 gram bonds you won’t want to wear anything else. For a full head of 1 gram bonds we would suggest an average of 125 – 150 bonds. For a half head we suggest an average of 75 bonds. Hair wefts are a very versatile form of hair extensions. 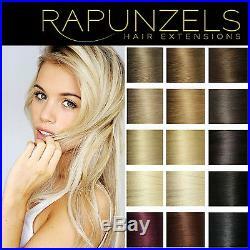 Our hair extension weave/weft is machine sewn along the top so you can cut the weft to size. Apply clips to make your own clip in extensions. Glue them in with products such as liquid gold hair adhesive. Braid or cornrow sew them or cut the hair from the weft and bond them with keratin tips. These are just a few of the ways you can apply hair wefts to create glamorous looking celebrity hair. Micro loop extensions are the most simple and innovative extensions to apply. They can be applied very quickly without the use of heat or glue so are the gentlest form of extensions for your hair. The micro ring is already in place so all that is required is a pair of small angled pliers to secure the bond. For removal simply open the bond with a pair of small angled pliers and slide the bond out of your hair. Micro loops are rapidly becoming the most popular form of pre-bonded extension application. 0.5 gram bonds are a great choice if you require finer highlights to your hair as they are half the thickness of our 1 gram bonds. They are suitable for all hair types and if applying several different colours will create a finer more subtle mix of colour. For a full head of 0.5 gram bonds we would suggest an average of 200 – 250 bonds. For a half head we suggest an average of 100-150 bonds. For shorter hair we would suggest adding an additional 25 bonds due to the long length of the hair to ensure you create a natural look. Rapunzels do not accept any liability for incorrect fitting of their hair extensions so it is imperative that hair is fitted by a qualified professional in this particular field of hair extensions. Our hair is 100% human hair and can be dyed however Rapunzels will not accept any liability for the outcome so it is important that you test a 1 inch piece first before dying the whole lot as you will void any return rights once the whole hair is dyed. We have found that these products have surpassed many other elite extension ranges so please follow our recommended aftercare as per our item specifics and use Herbal Essences shampoo and conditioner (light blue bottles for dry/damaged hair). Also invest in Organix Moroccan dry oil spray for the ends of your hair, spray liberally to the ends before blow drying and straightening. Always use a good heat defense spray if straightening or curling. Blonde hair needs to be treated with great care as it is highly processed and like with all brands of extensions will not last as long as dark colours. You must style extensions after washing and conditioning… You can not just “wash and go” firstly because any bonds will break down if left in wet and damp conditions, so the extension hair and bonds must be fully dried. Also raw hair must go through a process of de-coloring and re-coloring before it is made into the extension in order to conform to homogenous colors so that the customer will always get the same color. Because of this process, all extensions will not look optimal if just let air dry, you must take the time to fully blow dry. You will need to add a styling method after the hair is dried, like a straightening or curling iron or the least a straight blow-dry with a flat paddle brush, in order to smooth the cuticles, soften the hair and produce the shine again. Once you have done this, it will usually last a few days until your next wash. We suggest washing 2-3 times per week. Just remember that long hair is very fragile, whether your own or extensions. Never use too much heat as it may, over time, damage your hair and extensions. Always use the lowest possible settings and never direct the blowdryer onto the bonds for too long as this may cause them to get too hot and melt. Absolutely avoid swimming pools, saunas and sunbeds. Never ever sleep with wet hair, always ensure fully dry and tie in a loose ponytail before bed. The item “24 human remy hair extensions weave/weft DIY sew in, glue in, bond, braid, clip” is in sale since Wednesday, December 7, 2011. This item is in the category “Health & Beauty\Hair Care & Styling\Hair Extensions & Wigs\Hair Extensions”. The seller is “legend-trading” and is located in Gloucestershire . This item can be shipped to North, South, or Latin America, all countries in Europe, all countries in continental Asia, Australia, New Zealand.